Music: DJ Adrian Loving will spin hip-hop tunes in the Music Room. 5–8 p.m. Discussion: Poetic Voices: Hip Hop Here and Now at 6:30 p.m.
African-American music and poetry have become a soundtrack for a migrating global audience searching for its character. Artist Fred Joiner moderates a panel of poet-scholars in a discussion of hip hop as a force that blends cultural identities with the realities of modern life. In collaboration with the American Poetry Museum. Gallery Talk: Once upon a Picture — Lawrence as Storyteller - 6 & 7 p.m. Explore how Jacob Lawrence’s use of patterns and bold colors tells the story of the Great Migration of African Americans to the North in the early 20th century. 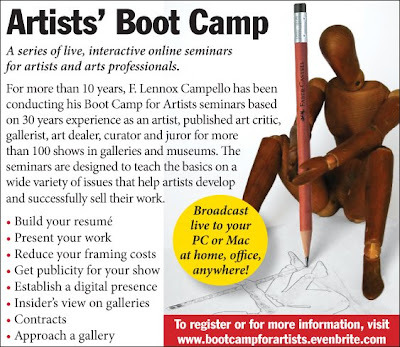 I'm going to be doing a free radio podcast tonight at 7PM talking about some of the issues from the Artists' Boot Camp Webminars and answering questions. Click on the image below for details and to sign up for the free webminars. Not unlike the groundswell of support during our recent national election, what began as the bubbling excitement of a few artists has swelled into a tsunami of artistic pro Obama output. Through word of mouth and passing conversations, a wide range of artistic talent and media has enthusiastically embraced the idea of celebrating the historic Presidential event. Perhaps as no other elected official in history, Obama is a canvas on which is projected the hopes and fears of a nation. 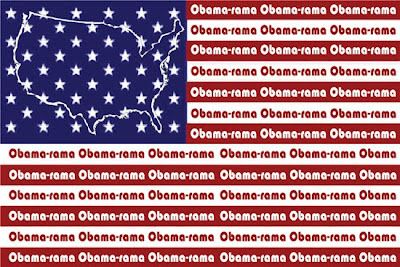 “Obama-rama” brings together many prominent Philadelphia area artists, as well as others, united in the celebration and critique of our nation's new commander in chief, including Elizabeth Bisbing, Jim Brossy, James Dupree, Roberta Fallon, Cheryl Harper, Frank Hyder, Tom Judd, Alex Queral, Libby Rosof, Shelley Spector, Ira Upin and others, including yours truly. Projects Gallery is located at 629 N 2nd St Philadelphia, PA 19123. Gallery hours are Wednesday & Thursday 4 - 7 p.m. and Friday & Saturday noon to 7 p.m. The show opens with a First Friday's opening reception for the artists on Friday, February 6 from 6-9PM, and continues through February 28th, 2009. Singers, actors and dancers can stimulate audiences, but can they stimulate the economy? The authors of the current stimulus package seem to think so — they have included $50 million for the National Endowment for the Arts and $150 million for infrastructure repairs at the Smithsonian. NPR story by Elizabeth Blair here.